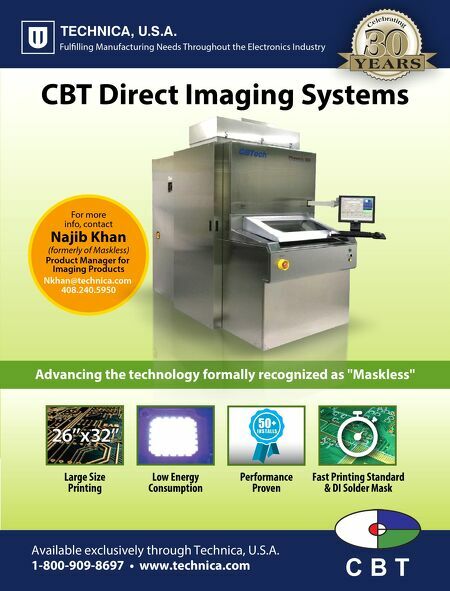 18 The PCB Magazine • October 2016 by Yash Sutariya SATURN ELECTRONICS AND SATURN FLEX SYSTEMS When I was asked to contrib- ute an article for this issue on lead- ership, I thought it was an oppor- tune time since my Dad, Nagji Su- tariya, had recently passed away. I had spent nearly every daylight hour with him since I started working with him at Saturn in 2001. Along the way, I picked up what drove him as a business- man, a father, and a member of our community. I am proud to share the lessons I gleaned along the way. Perhaps a brief history is in order here. In 1969, Dad left his arid Indian village for Michigan's Upper Peninsula. In pursuing a Masters in Mechanical Engineer- ing from Michigan Tech, he had basically moved from a desert to a landscape surrounded by water that frequently reached sub-zero temperatures during the winter. After graduation, he could not find an en- gineering position, so he took work wherever he could find it. Finally, in 1977, he landed a full-time job at Ford Motor Company's seat de- sign department. Never satisfied and always the entrepreneur, he complemented his daily grind by moonlighting in diamond and art imports while investing in rental homes. At the advice of friends, he devised a plan and gathered partners to start Saturn Electron- ics Corporation, in September of 1985. A mix- ture of hard work, perseverance, and at times good luck propelled the startup to a $22 mil- lion company by 2000. Moreover, his fiscal discipline allowed us to survive the crash of 2001/2002, which enabled us to continue breaking sales records after our recovery throughout the next 15 years. As we move The Saturn Group forward, his legacy endures through the lessons he taught and the example he set. It is my honor to share my Dad's business leadership tenets with you. Know Your Business Dad was a big believer in stay- ing active in every facet of his busi- ness. He was quite the opposite of most of the business owners I in- teracted with during my stint in bankruptcy/turnaround consult- ing. Often, business owners who found themselves in trouble once knew every detail of their com- pany, but now found themselves focusing more on sales-related activities and relying on others to handle operations, account- ing, and engineering. Dad wore multiple hats at our company. He would tell customers that not only was he the president, but also the CFO, QC manager, and HR manager. And truly he was the official quality manager from Saturn's inception until his first cancer treatment in 2009. So not only would you se e him involved in technical aspects such as quality control and product de- velopment, but he worked closely with suppliers to immerse himself into the details of chemis- tries, materials, and machines. Furthermore, he would constantly walk the floor to ensure they were being utilized effectively. I've thrown him out of the factory floor more times than I can count when I found him up ladders or loading panels into a machine. You couldn't keep the man out of trouble, it seemed. 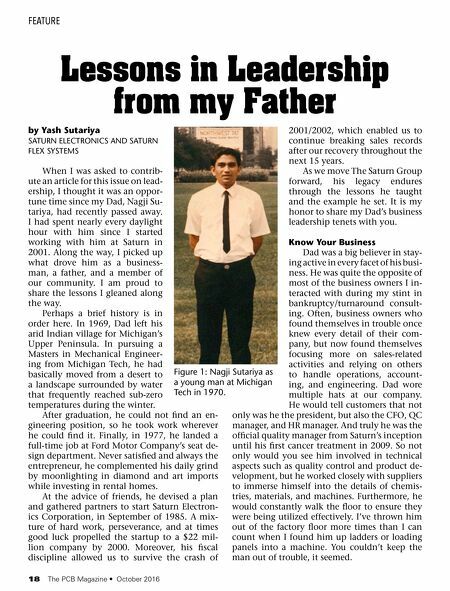 Lessons in Leadership from my Father FEATURE Figure 1: Nagji Sutariya as a young man at Michigan Tech in 1970.